With these words, Kennedy expressed what had been gaining currency ever since the founding of the state of Israel: American Jews and Israel had entered into a symbiosis with Israel in which the superpower United States and tiny Israel entered into a mutual dependence that assured Israel its survival and provided the United States with an important strategic partner in the Middle East. This close cooperation was both initiated and advanced by the American Jews. As a consequence of this close alliance, the United States found itself as important negotiator in Israel’s peace talks with its neighbors. It’s true that American Jews form a minority, though in their numbers they exceed the entire Jewish population of Israel. Between 1914 and 1939, more than a million Jews came to America and constituted a third of the total Jewish population in the world. In the 1980s, the number of Jewish inhabitants in the United States amounted to not quite six million—of whom 1.5 million live in New York. The numerical ratio explains the large influence that the American Jews have been able to exercise as a lobby to the benefit of Palestine, later Israel. In the United States, one does not consider the word “lobby” as something negative in any way, but rather as a legitimate community of interests. This shows how matter-of-factly the Americans deal with the political ambitions and the active interest of the American Jews in Israel. One can only wish that the word “lobby” would lose its (anti-Semitic and Israel-hostile) connotation in Germany. It is a homogeneous group which has fully assimilated itself, but whose self-awareness in the last decades seems to be dependent exclusively on Israel’s strength. Israel’s struggle to survive became a “civil religion” of the American Jews, especially after the Yom Kippur War in 1973, became part of a “civil Judaism” in the United States, which replaced a serious engagement with religious subjects and internal values. American Jews create out of Israel a symbolic ethnic bond that assures their own identity in the Diaspora. Without Israel, they would lose their own roots and would not survive as a minority—and without American Jews, Israel would have ceased to be independent state. The Zionist movement in the United States strengthened itself in the Twenties with the immigration of poor Jewish refugees from Eastern Europe, mostly from Russia. Many of them were union members, socialists, intellectuals and Zionists—even Golda Meir, later the prime minister of Israel. However, the elite of American Jewry committed itself only financially and materially for the concerns of the Zionist construction work in Palestine. In President Woodrow Wilson’s administration, Jewish personalities entered higher government posts for the first time; these office-holders were then in a position to transform their Zionist ideas into fact. The beginnings of the so-called “Jewish lobby” in Washington were laid. President Truman and Israel’s first Prime Minister, Ben Gurion. American Jews closed ranks when the first reports about the Holocaust reached America. They stepped up their political pressure on the government. In May 1943, the American Zionist Emergency Council demanded in its “Biltmore Program” the official transformation of Palestine into a sovereign state of the Jews. The country was supposed to be opened up for the unrestricted immigration of Jews—under the control of the Jewish Agency for Palestine. The program was accepted by the All-Jewish conference—against the votes of the non-Zionist American Jewish Committee. In 1944, President Franklin Delano Roosevelt wanted to solve the problem of Jewish refugees by distributing the flows of refugees into various countries or by establishing a new settlement area—outside the United States—in Colombia. However, 1944 was an election year, and the potential of the Jewish voters were not to be underestimated. Polls indicated that the election decision of American Jews would depend on the Palestine question. In the Senate, the zeal for the Jewish issue began to take on non-partisan forms, and on Feb. 1, 1944, a draft resolution was introduced that made the “Biltmore Program” into a government task. And new documents have revealed FDR’s Eugenic Project to ‘Resettle’ Jews During World War II. Ninety per cent of the American Jews supported the proclamation of the state of Israel and Jewish immigration there. Plus, they greeted the decision of President Harry Truman, who had assumed office upon Roosevelt’s death in the middle of April 1945, to recognize the Jewish state only eleven minutes after the proclamation by David Ben-Gurion. In July 2003, however, a previously unknown diary by Truman, long regarded as a friend of the Jewish people, surfaced that revealed Truman’s anti-Semitic beliefs. Without the enormous financial support of the American Jews, the founding of Israel would not have been so quickly realized. Many American Jews had been able to save significant sums of money during the economic boom of the Second World War, which they now wanted to make available to the young state. The United Jewish Appeal started a donation drive in 1948 that remained without parallel: In all, 205 million dollars were collected that had been donated by Jews throughout the country. This sum was four times as great as the donations that the entire population of North America gave to the Red Cross that same year. Does American Zionism Include Israel? If Zionism meant founding an independent state for the Jews, then American Jews at the end of the Second World War were confirmed Zionists—without obligating themselves for immigration to Israel. This ambivalence still holds today: According to a 1983 poll, 39 percent of American Jews and 50 percent of the representatives of Jewish organizations consider themselves Zionists. At the same time, they’re not any more Zionist-minded than are some Christian Americans from the “Bible Belt” in the heartland of America. They’re just pro-Israel. Only 60,000 American Jews emigrated to Israel between 1948 and 1982. They have it too good in the United States to give it all up and begin from scratch, and the values in the Holy Land, which focus less on individualism and unrestricted freedom, are foreign to them. 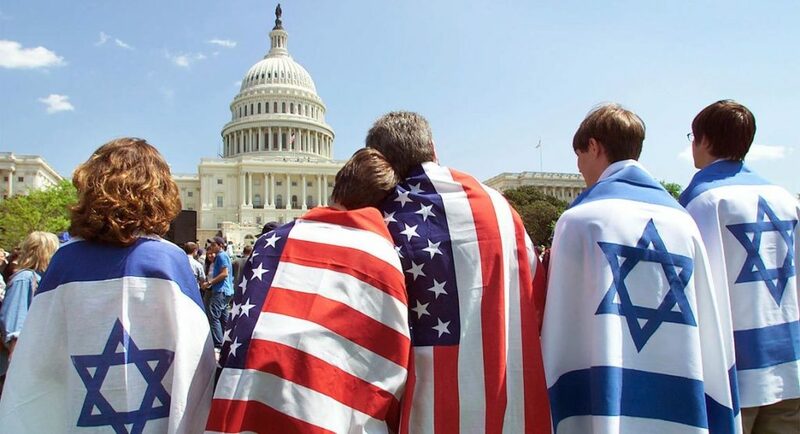 The American Zionist continues to live in the United States, supports Israel financially, politically, even emotionally, but he or she identifies with and orients himself/herself on Jewish organizations in his/her surroundings. According to a study from 1982, 82 percent of American Jews refuse to make their Jewish identification dependent on immigration to Israel. And only 17 percent in 1983 reported having seriously given thought to immigrating to Israel. Many American Jews even cringe before the word “Zionism”: It connotes for them a total obligation toward the Jewish state—in other words, immigration. For them, Zionism is not a part of a philosophy of life, but rather the pressure to give up their old life at some undefined time. For some American Jews, however, the centrality of Israel is a commandment in their lives that must be again and again internalized and proven within the Jewish communities. Zionism, that is, Israel, becomes an avowal of faith, becomes a substitute religion for American Jews. But only a few of them—all of 25 percent—have ever visited the Holy Land. “The goal of Zionism is the immigration to Israel. American Jews live with this conflict their entire life,” describes Jonathan Helper, an Orthodox psychologist, the dilemma. Nonetheless, this inner conflict became a problem for the American Jews only a long while after the founding of the state. In 1948, they were still urgently needed in the United States, and they saw their task in supporting the young state from here, in order to guarantee the cooperation and assistance of the presidents. Truman had no foreign policy experience at the time he assumed office. The “Jewish Lobby” used this deficit to its advantage. 1948 was an election year. Truman promised the Jewish voters that he would stand up for Israel’s admission to the United Nations and he announced financial aid for Israel in the form of a low-interest loan of 100 million dollars. 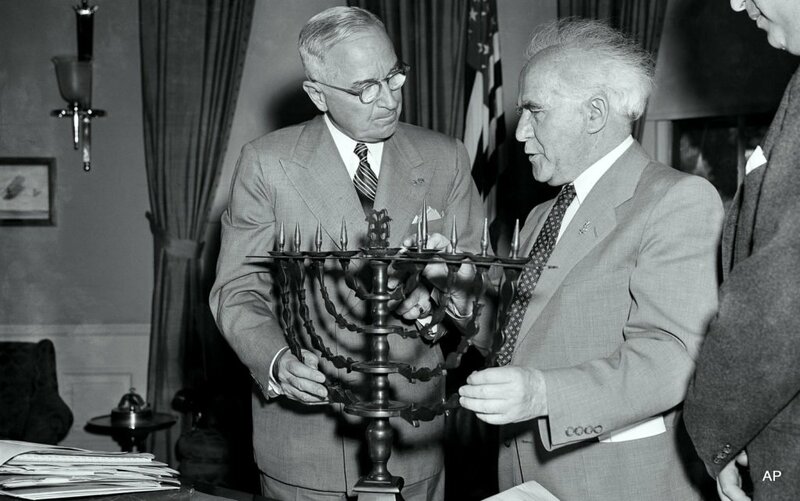 Truman received 60 to 70 percent of the Jewish vote after his promises. He exerted himself intensively during his term of office to help Israel, through American support, to achieve secure borders and peace with its neighbors. This aid has continued up through the present day. It manifested itself in the Camp David Accords under Jimmy Carter and the handshake between Yitzhak Rabin and Yasser Arafat on the lawn of the White House under Bill Clinton. As opposed to Truman and Eisenhower, Kennedy had personally visited Palestine and, then later, Israel: first in 1939, then in 1951. For him, Zionism was a legitimate national movement of the Jews, and he recognized Israel’s right to exist and saw in the Jewish democratic state a natural partner of the United States. Kennedy was supported by 81 percent of the Jewish voters. He was the first American president who invited an Israeli prime minister to Washington for official talks at the executive level. Kennedy’s successor, Lyndon B. Johnson, was almost even more pro-Israel in his thinking. It was said of him that Israel had become the 51st state of the United States during his term in office. 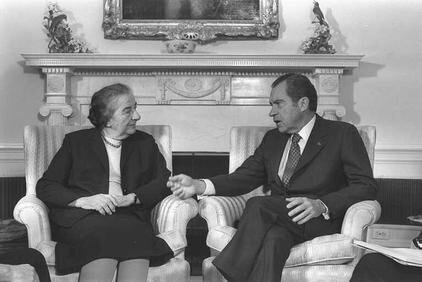 Israeli Prime Minister Golda Meir and President Nixon in the White House. This ritual soon came to an end. The majority of Jewish voters did not support Richard Nixon. Therefore, he didn’t owe anything to them and made it known that in the future, American Jews could no longer count on “dictating” American policy. Nixon’s government was composed of his personal supporters and not of politicians from the various interest groups in Washington. The new government operated from an emotion-drained interest politics in its Middle Eastern policies. But even Nixon, teeth grinding, had to give in to the pressure of American Jews when he introduced his “Rogers Plan” in 1969, a plan that presented his American foreign policy in the Middle East. The plan rested on increased cooperation with the Soviet Union in the solution of the Middle East question and thus accorded with Israel’s worst fears. Thereupon, 14,000 prominent Jews demonstrated in Washington and called upon the president not to leave Israel behind. Pro-Israeli resolutions in the Senate and House of Representatives received broad support. In these years, the “American Israel Public Affairs Committee” was formed, a group that worked actively in Washington, representing Israel’s interests and performing valuable explanatory work. Under this pressure, Nixon finally gave in: He assured Golda Meir that he would not force Israel to accept the Roger Plan, and he publicly repeated this assurance in 1970 at a convention of Jewish delegates. In 1971, the initiatives on the Middle East issues were turned over to Henry Kissinger—a politician of the Realpolitik stamp, and, incidentally, of German-Jewish background. In the following years, Nixon was able to win 35 percent of the Jewish votes instead of the 17 percent at the previous election. With the close of the Nixon era, the Middle East policy increasingly became a matter of domestic policy and, as Wolfgang Weber asserts in his conclusion, “mainly stamped with Israeli interests”. President Jimmy Carter was an outspoken friend of Israel. He felt a deep Christian-moral duty to solve the Middle East question on an enduring basis. The peace policy in the Middle East became a major part of his foreign policy, which reached its climax with the peace treaty between Israel and Egypt. 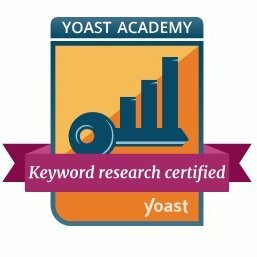 Who Needs a “Jewish Quota”? President Ronald Reagan saw the Soviet Union as the source of all evil. For him, the Middle East became a strategic calculation. Israel was especially endangered because of a possible encroachment by the East Bloc, and Reagan promised to move the American embassy from Tel Aviv to Jerusalem; he received 39 percent of the votes of the Jewish electorate, with which he carried the election against Jimmy Carter. Israel was now officially integrated into the strategic concept of the United States and became an immediate element of the security—political, military and armaments—technical efforts of the United States. However, there were no Jews in the Reagan administration, nor were there any pro-Israeli members in the Senate, and in the Supreme Court, the “Jewish quota”, the so-called “Jewish seat” disappeared. True, there were still Jewish representatives on the political scene, but they now appeared less as “Jewish interest groups” (the so-called “Jewish political machines”) and only when it involved Jewish concerns. To the symbiosis of the American-Israeli relations was also added the ever-stronger growing exercise of influence on Israel’s domestic policies by American liberal Judaism. Just until shortly before the peace negotiations in 1993, religious differences between the American Jews and the Israelis always receded into the background, behind the security problems and the survival of the Jewish state. Israel was the esteemed mouthpiece in the matter of Judaism and religion, granted a monopoly to Orthodox Judaism, and with that able to decide over the concerns of the Diaspora. The American Jews supported Israel unconditionally. However, as was soon to be demonstrated, their attitude gradually changed. But first, the American Jews had to deal with the trauma of the Yom Kippur War. It formed a turning point in the relationship between American Jews and Israel. American Jews fell into a panic, fearful of a new Holocaust, this time in the Middle East. Even those who had never felt very close to Israel became pro-Israel—including the American anti-Zionist movement. The devotion of the American Jews was boundless and came fully unexpected. With the Yom Kippur War, the subject of the Holocaust became current for American Jews. In many places, Holocaust museums and memorials were built. One swore never to forget, and even young Jews, whose families had been spared from the Holocaust, felt directly affected by the tragic history. This newly-found bond to Israel reflected itself in the readiness of American Jews to further support the country financially. During the Six-Day War, they had donated a total of 180 million dollars for Israel. The entire U.S. military aid for Israel in this same period of time only amounted to just under 33 million dollars. From 1948 until today, American Jews have donated around 7 billion dollars. Two-thirds of this sum flowed through the United Jewish Appeal (UJA), which was founded in 1934. In 1987 alone, one million Jews collected 750,000 million dollars, with half of this sum going to Israel. Between 1969 and 1973, 6,000 American Jews per year emigrated to Israel, on average—in contrast to 2,000 in the year 1982 and only 700 in the middle of the Sixties. The war of 1967 and the Yom Kippur War altered the individual and collective self-sense of the American Jews, who entered into a spiritual bond with Israel. The zeal to assimilate dropped; one was now consciously part of an ethnic and religious minority, one was proud to be a Jew, coupled with a strengthened will to survive, to defy all opponents of the Jews. Israel’s victory was celebrated as a triumph of the Jews, a strong Israel symbolized the strength of Jewry, and the small nation became a fixed point in American-Jewish community work. In synagogues, the Israeli flag was hung next to the American Star-Spangled Banner; passages were inserted into the Sabbath and holy day prayers that dealt with Israel’s welfare and security. More than thirty of the largest Jewish organizations are now affiliated with the “Conference of Presidents of Major Jewish Organizations”, which strongly supports Zionist and pro-Israel campaigns. With the Lebanon War of 1982, for the first time, Jewish groups turned against Israel. Shocked by the pictures of the destruction and the spilling of blood, especially after the massacres in Sabra and Shatilla, they demanded a hasty withdrawal of Israeli troops from Lebanon. In the 1984 election campaign, Jewish voters had direct influence on the Democratic presidential campaign: They ardently opposed the black presidential candidate Jesse Jackson after he had strongly criticized Israel and expressed his support for the PLO. In 1987, the PLO suffered further setbacks, when the American government decided, under pressure from Jewish voters, to close the PLO Information Office in Washington as well as the PLO’s observer post at the United Nations in New York. Since 1985, the cooperation between the United States and Israel has become ever more intensive, and the 99th Congress supported military aid for Israel even more vehemently than before. In 1985, both houses of congress resolved to furnish Israel with military aid amounting to 1.8 billion dollars, as well as 1.2 billion for economic assistance. In April of that same year, a further 1.5 billion was made available after the Israeli government agreed to carry out economic reforms in the country in order to stem inflation. 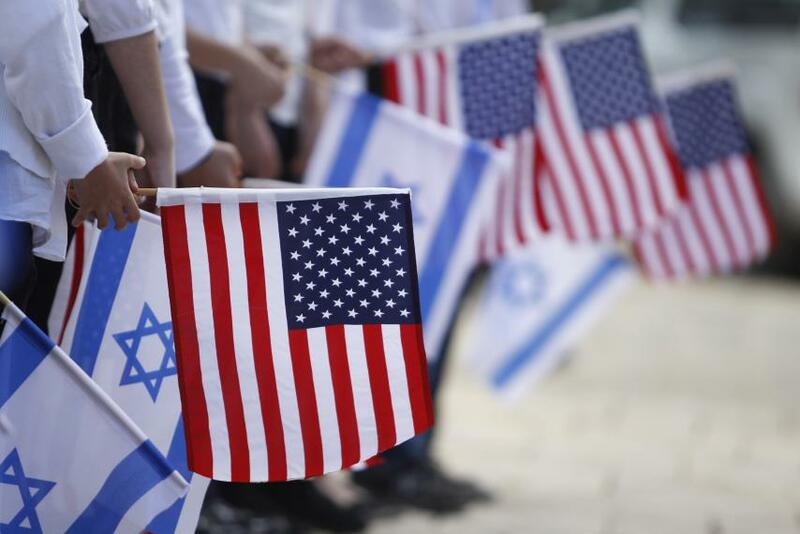 On April 22, the United States and Israel signed the “Free Trade Agreement” (FTA), which, in stages, lifts customs duties for Israel’s export products into the United States, and was supposed to make the import of American goods easier as well. According to the Israeli Eitan Gilboa, “The American financial assistance for Israel shows in the clearest way possible the growing identification of the American Jews with Israel.” A spate of opinion polls during these years indicated that the majority of American Jews expected massive military support for Israel from their government. And thus, between 1971 and 1985, Israel received economic and military support of around 30 billion dollars. Half of America’s Jews even pleaded the case for American assistance to Israel even if through this policy, the United States itself would be somehow drawn into a war in the Middle East. And American Jews continue to be generous. In the Seventies, half of them reported having donated to the United Jewish Appeal. In 1980, that figure had already climbed to 83 percent. The largest part of these moneys benefited Israel. 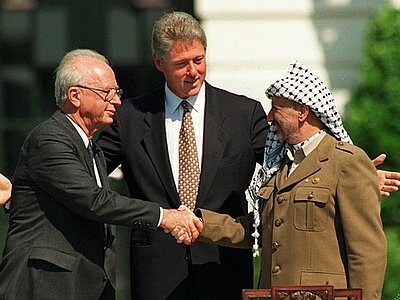 Yitzhak Rabin, President Clinton and Yasser Arafat. Beyond all these activities, the United States played an active role in humanitarian projects, as, for example, in the transport of 7,000 Ethiopian Jews to Israel. The costs for this project were largely covered by American financial aid. The secret operation was approved by the U.S. Senate, directed by the CIA and the U.S. Defense Department, and supported by the president. The Ethiopian Jews were flow out of Sudan to Israel on Hercules transport planes belonging to the American air force, as the airspace over that North African country was barred to Israeli aircraft. Beyond all this, the United States—with active support of American Jews—actively engaged itself against the UN resolutions that equate Zionism with racism. The Jews in the United States continue to support every Israeli prime minister—be it from the Labor Party or the Likud Bloc. However, their blind ties to the Holy Land are slowly changing. To the question of whether they would consider it a personal loss if Israel were destroyed, 90 percent of American Jews still answered yes in 1957. By 1983, this figure had dropped to 77 percent. Even in the peace policies, American Jews have a voice: in 1980, 90 percent of them believed that Israel was doing right in not negotiating directly with the PLO. Two years later, the number had dropped to 76 percent and by 1984 it had slid another ten points to 66 percent. Today, (with the exception of most of the Orthodox Jews in the country), the majority of America’s Jews are for the peace process in the Middle East, for American mediation in the peace negotiations and the “land for peace” formula. 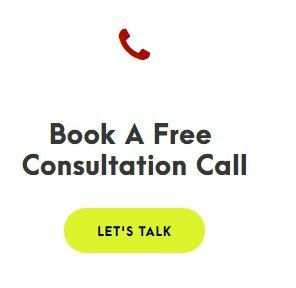 According to one poll by the American Jewish Committee in January 1996, 79 percent of American Jews were for the continuation of the Oslo peace process under Yitzhak Rabin. And in an October 1997 poll by the Israel Policy Forum in the United States, the findings indicated that 84 percent of American Jews believe that the United States should exert pressure on both the PLO and Israel in order to resuscitate the stalled peace process. In addition, 79 percent greeted a temporary freeze on the settlements policy in the autonomous areas as well as in East Jerusalem (a so-called “time-out”). Nevertheless: The older generations who heard about the Holocaust from afar, who fled the Holocaust or who remember the wars in the Middle East, have a stronger connection to Israel. Younger Jews, those who belong to Reform Judaism, those who are not practicing, or those, who have not themselves experienced even at second-hand the Holocaust and the threat to Israel, have a more distanced attitude toward Israel. According to a poll by the American Jewish Committee (AJC, founded in 1906) conducted in the mid 1990s, the majority of American Jews find it legitimate to criticize Israel in a given case. Only 25 percent reported that they “feel very closely tied to Israel”. While 69 percent of the Orthodox Jews answered this in the positive, this contrasted sharply with the 26 percent of the secular Jews, who gave the same answer in a 1995 poll. Two-thirds of American Jews have never been to Israel yet, and in 1995, 51 percent felt that it was of prime importance “to be a part of the Jewish people.” Only two percent reported that their sense of belonging to the Jewish people expressed itself in a special love for Israel. With the Oslo peace process, the immediate endangerment of Israel seemed to have faded and American Jews felt they could finally address important cultural and emotional points, which up until now had to be deferred by reason of the existential threat to Israel, and were thus not able to be considered in the Jewish-American-Israeli dialogue. Those include the scornful attitude of Israelis toward Reform Judaism, the question “Who is a Jew?” and the Israeli-held view that American Jews continue to owe Israelis total submission and blind support because they live in relative security as opposed to Israelis, who are faced daily with the raw reality of the region. American Jews strive more than ever to carve out their own path. Assailing the Orthodox monopoly on power, they see their religious identity in moderate Reform Judaism, which in fact had its beginnings in Germany, though in the United States it has become the religion of choice. In October 1997, the delegates of the World Jewish Congress, the “parliament of the Diaspora,” were elected here. The election results can be evaluated as a referendum, as indication of the Jewish-religious affiliations of the American Jews. 73.7 percent of those entitled to vote cast their votes for the Reform and Conservative movements—with only 10.8 percent of the vote going to the Orthodox branch. This showed the growing gap that has opened up between Israel and American Jewry. This “religious cutting of the umbilical cord” by the six million American Jews will without a doubt have an effect on other aspects of the relationship with the state of Israel—for better or worse. More than ever, a depressing identity conflict has spread among American Jews: They are Americans, but at the same time closely tied to Israel. This crisis of loyalties reached its zenith during the Pollard affair. Jonathan Jay Pollard, an American civilian working for the U.S. Naval Intelligence Service, was revealed to be an Israeli spy and has been held in American imprisonment since Nov. 21, 1985. The U.S. government refuses to extradite Pollard to the Israelis and no Israeli prime minister has gone without trying to request Pollard’s pardon. This espionage affair placed a damper on the American-Israeli partnership, and it took some time before the United States had overcome this breach of trust by its small partner. American Jews felt compelled to decide between their loyalties to both countries, and they expressed fear that the Pollard Affair could have a negative effect on their status in American society. Some Jews openly distanced themselves for the first time from Israel’s security policies. Israelis will have to gradually learn that the Jews in the Diaspora—and especially in the United States—have a lot to offer, and that Israel can learn a great deal from the American Jews, for instance the separation of religion and state. But many Israelis feel detached from American Jewry and some of its leaders are showing less flexibility toward American Jewish leaders. The gap between Israelis and American Jews is getting wider. But for many Jews in the Diaspora, Israel, despite all disagreements, is still a source of pride, a staple of their own identity and a guarantee for their sense of belonging. Nonetheless, many Israelis appear to merely “tolerate” the Jews in the Diaspora, though they expect continued material support. American Jews, on the other hand, face the dilemma of wanting to criticize Israel without at the same time fomenting anti-Semitic and anti-Israel propaganda and thus playing into the hands of Israel’s opponents. Beyond this, they also don’t want to make it easy for potential demagogues in the Knesset to bring up American Jews and their behavior toward Israel as an election issue. Nathan Glaser of Harvard University believes that the influence of American Jews has never been greater, “But is it still a Jewish influence?” he asks. Their assimilation has already progressed so far that in the future, they “will have a common ethnic background—but not much more that. American Judaism will be Judaism without content.” As opposed to this, Israelis will preserve their Judaism, because they will always play an outsider’s role alongside the Arabs in the region, and can only maintain their identity in this way. The American Jewish organizations are intensifying their explanatory work on the peace process and actively support it. Israel maintains ten more representative offices in America than any other country. Even Israel’s ministries for finance, agriculture, tourism, industry and commerce have branches in the United States. The largest foreign office of the Israeli defense ministry is also located here. In return, America helps Israel to get accepted into the international community of nations as an equal partner: The American Jewish Committee recently took out a full-page ad in The New York Times, in which it requested that the United Nations would finally provide a seat for Israel in the Security Council. Israel is also a topic in the largest newspapers in the United States, one that finds considerable space. The New York Times publishes extensive reports about Israel on a daily basis, even on purely domestic political topics. The op-ed pages feature weekly commentaries on Israel, and even in the letters to the editor there are usually lively discussions on how the peace process is to be advanced. The mostly Jewish authors of these letters do not stint on offering sound advice. The connection of the American Jews to Israel will not change in the near future, says Robert B. Goldmann of the Anti-Defamation League in New York. He assumes that the close ties to Israel will not weaken “as long as these people will not lose their own Jewish identity, their own culture and their role within the American society.” This newfound identity “will have to be built on the present and not on the past,” according to Goldmann. The self-discovery will take a long time—and until then, the symbiosis between American Jews and Israel will continue. No matter where the US embassy is located in Israel. The Reinvention of Jewish Space by Amotz Asa-El, The Jerusalem Report, Part I, July 2017.